For many, it feels like there’s an overwhelming amount of things to think about! But in all honesty, taking control of the important things in life just feels good; you know it's the right thing to do for you, and your family. - Prepare a contact list of individuals who should be notified in a medical emergency or death. - Write an obituary or simply jot down information you would like included in an obituary. 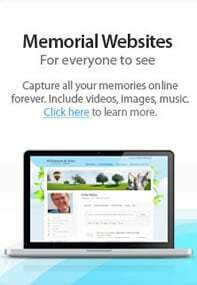 - Decide where obituary and memorial information should appear. - Select the speakers and the eulogies that you would want to represent you. - Decide what organizations or church will benefit from memorial donations in your name. The people who know and care about you will be there when you need them. You only need to provide them with instructions, important financial details, and then relax. You’re in good hands. - Give your Executor a copy of your Will. Safety deposit boxes are often opened up during the estate settlement process, long after the funeral. Any funeral planning documents therein can be of no help to your executor. - Make sure your representative has a list of important account information or telephone numbers for retirement plans, insurance policies, investments, bank accounts, safe-deposit boxes, properties, preferred law and accountant firms and mortuaries. Remind your personal representative that the Social Security Administration will need to be called and, if you're receiving benefits such as those from the Veteran's Administration, they should be contacted as well. - Designate a power of attorney to ensure that proper information can be accessed in the event of your illness or death. Make sure a durable power of attorney for health care and a living will are in place so that your wishes are carried out if you are unable to do so. - Make arrangements for telephone and utilities services, and newspaper and magazine deliveries, to be cancelled. - Make arrangements for pets to find a new home. You can also contact us for additional information. We're pleased to answer any questions you may have, without obligation.